1 - pair/s $5.90 ea. 5 - pair/s $5.30 ea. 10 - pair/s $4.90 ea. Mens 100% Cotton Comfort Top Dress Socks provide the very best solution for those people who need a sock to relax fit as the day goes on and does not leave marks on the legs at the end of the day. 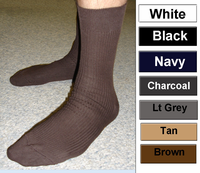 Please note: These socks will not stay up as well as the socks we offer with the bit of nylon on top (please see the options below), but this is for our customers that need 100% cotton with a non-binding sock that gives way as the day goes on as to not leave a mark on the person wearing the sock. Style number 6120. 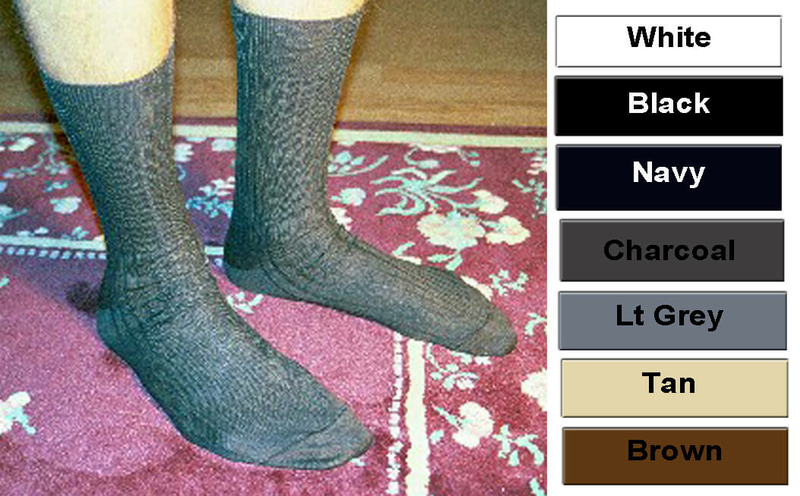 • By design: the top of the sock gives way as the day goes on so it will not leave marks on your leg. It may fall down as the day goes by. New! Need all cotton sock but also have problems with bleaches or dyes? We will be adding a mens dress sock in the sizes above that will have no bleaches or dyes, it is just the plain 100% cotton in the english rib like above but before it goes through the rest of the process. Just choose Color: NEW! Natural - Unbleached and your feet will thank you! Our wear testers found this sock to be great for people that absolutely need 100% cotton that the tops give way and tend not to leave marks, but they do tend to fall down by the end of the day. 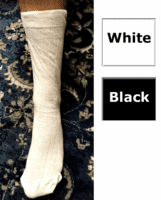 Need all cotton sock but want it to be a thicker, medium weight sock? 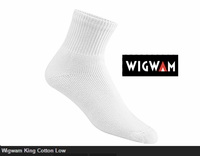 We offer 100% Cotton Wigwam Sport Socks and a 95% cotton Wigwam King Cotton that offer an additional comfort feature of a cushioned bottom for all day comfort.